Russian smartphone maker Yota Devices might have plastered the airwaves when it released a dual-screen device with an E-ink display called YotaPhone and its successor, YotaPhone 2, but the company is going to have another competitor in the form of Siswoo R9 Darkmoon. What separates YotaPhone 2 and Siswoo R9 Darkmoon? Better hardware specifications of course. We’ll get to those details later, but for now, having a 64 bit processor, along with 3 GB of RAM and an LTE modem in the latest handset seems to be the perfect combination that that you require from a device that is equipped with both a regular screen and an E-ink display. Before we point out the boatload of differences separating the two handsets, let us look at those features that are similar between YotaPhone 2 and Siswoo R9 Darkmoon. Starting off, both smartphones feature a 5 inch screen size rendering the 1080p resolution. This side runs the Android operating system while the other one runs an E-ink display that has a screen size of 4.7 inches and a resolution of 960 by 540 pixels. Moving on, both smartphones feature an LTE modem, NFC chips and support for wireless charging. While YotaPhone 2 features an 802.11 ac Wi-Fi adapter, GizChina reports that Siswoo R9 Darkmoon features a wireless adapter that supports both 2.4 and 5 GHz frequencies, giving sufficient evidence that the wireless adapter supports dual-band functionality. This obviously indicates that the adapter will deliver speeds no less than the 802.11 n wireless standard. Now let us come to the juicy details. Siswoo R9 Darkmoon is armed to the teeth with MediaTek’s MT6752, which is running an octa-core processor featuring a clock speed of 1.7 GHz. For those that need to take a stroll down memory lane, MT6752 is the same SoC present in Lenovo K3 Note (running at the same clock speed). Keep in mind that K3 Note’s processor is able to defeat Snapdragon 801 present in OnePlus One, which means that Siswoo R9 Darkmoon automatically snares the first position against YotaPhone 2, which also features a Snapdragon 801. Additionally, having 3 GB of RAM in Siswoo R9 Darkmoon will allow for more multitasking headroom compared to 2 GB of RAM present in YotaPhone 2. Siswoo R9 Darkmoon will also provide more battery life thanks to its 3,000 mAh battery. In contrast, YotaPhone 2 is only equipped with a 2,500 mAh juice box. We’re not through yet. Siswoo R9 Darkmoon also features a 13 MP rear shooter, compared to the 8 MP rear sensor incorporated on YotaPhone 2. The Chinese handset will also provide support to use to two SIMs simultaneously. Unfortunately, the most important detail has not been revealed by the company. According to Engadget, YotaPhone 2 carries a price of €700, which is equivalent to $792, making it a very expensive purchase, should you intend on purchasing it. 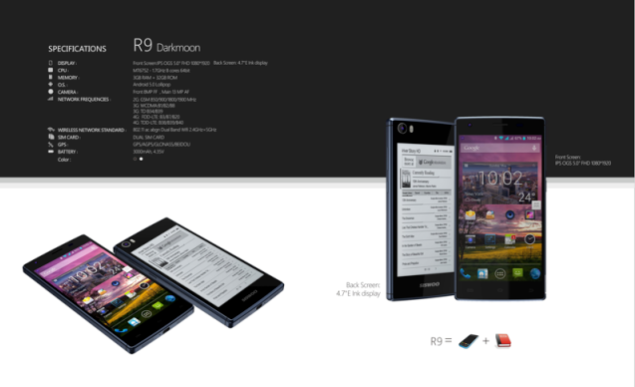 If Siswoo is able to price its R9 Darkmoon for anywhere below the price tag of YotaPhone 2, then it will become an automatic winner. After all, better hardware specifications and cheaper price equals a clear winner right?